Most popular chain furniture retailers sell primarily on price. And that’s why they always seem to host one sale after another. Granted, customers can get home furnishings at great prices from big box retailers. But, as you will find out in How to Buy the Right Home Furnishings, Part 2, there may be more valuable issues to look for than a low price. The initial price of solid hardwood, custom-made furniture usually runs higher than its factory-made counterparts. 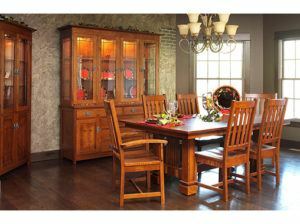 And the furniture offered by Brandenberry Amish Furniture is a case in point. However, when one factors longevity into the equation, Brandenberry custom hardwood furniture prices out to be a better deal. And this is because artisans build Brandenberry’s furniture to last for generations to come. Which furniture should you buy? How to Buy the Right Home Furnishings, Part 2 will help. Consider the way Brandenbery’s furniture is built. And it’s easy to see why value is no idle talk. Skilled Amish cabinetmakers painstakingly handcraft each piece of furniture. And they use solid hardwoods — such as oak, maple, cherry and hickory. Also, the Amish men do not use bargain substitutes, such as particle board and veneered cardboard. What’s more, the Amish men use tried-and-proven techniques and supplies. For example, they build with dovetail and mortise and tenon joints. Plus, they never use nails, brads and the like. In addition, Brandenberry’s Amish artisans sometimes use quarter-sawn wood instead of traditionally-sawn wood. Quarter-sawn lumber is pricier. But it yields many benefits. Like less cupping, expansion and contraction. Plus more spectacular genuine woodgrain patterns. It’s little wonder that Brandenberry’s furniture builders handcraft each piece to last for generations to come. In fact, they often become cherished family heirlooms. So assess your budgetary limitations. Then, figure time and durability into the equation. And make your choice. Contact a trusted expert in the custom hardwood furniture business, such as the product experts at Brandenberry. Because they’ll be able to give you hands-on, personalized help. What type of wood should you built with? Which type of hardware would work best? What furniture design styles are trending these days? How should you take care of solid hardwood furniture? Bring your questions. And a Brandenberry expert will provide answers. Still interested in learning more about the vast world of solid wood furniture? Visit Brandenberry’s ‘brick and mortar’ store in Shipshewana, Indiana. And discover for yourself a complete selection of Amish furniture. Browse Mission furniture, Shaker furniture, traditional furniture, rustic furniture, custom and modern furniture. And everything in between. You’ll discover what makes Indiana Amish furniture so special!